New York : A team of international researchers has, for the first time, identified a fungus as the key factor in the development of Crohn’s disease. 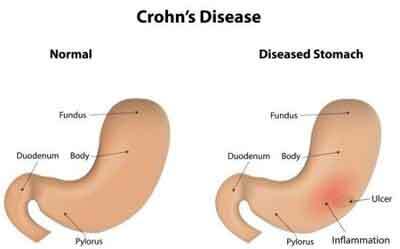 Crohn’s disease is a debilitating inflammatory bowel disease, which causes severe abdominal pain, diarrhoea, weight loss and fatigue. “We already know that bacteria, in addition to genetic and dietary factors, play a major role in causing Crohn’s disease,” said Mahmoud A Ghannoum, Professor at Case Western Reserve University in Ohio, US. Both bacteria and fungi are micro organisms that can only be seen with a microscope and inhabits the human body. Collectively, the fungal community is known as the mycobiome, while the bacteria are called the bacteriome. Essentially, patients with Crohn’s have abnormal immune responses to these bacteria, which inhabit the intestines of all people. While most studies have focussed on these bacteria, few have examined the role of fungi, which are also present in everyone’s intestines, the researchers said. The study found strong fungal bacterial interactions two bacteria (Escherichia coli or E.coli and Serratia marcescens or S. marcescens) and one fungus (Candida tropicalis) in people with Crohn’s disease. The three were found to work together (with the E. coli cells fusing to the fungal cells and S. marcescens forming a bridge connecting the microbes) to produce a bio film a thin, slimy layer of microorganisms found in the body that adheres to, among other sites, a portion of the intestines which can prompt inflammation that results in the symptoms of Crohn’s disease. This is first time any fungus has been linked to Crohn’s in humans. Previously it was only found in mice with the disease, the researchers noted. The study also found associations of the new bacterium S. marcescens in the Crohn’s-linked bacteriome. Additionally, the presence of beneficial bacteria were found to be significantly lower in the patients with Crohn’s disease. “Among hundreds of bacterial and fungal species inhabiting the intestines, it is telling that the three we identified were so highly correlated in Crohn’s patients,” Ghannoum said. For the study, published in the journal mBio, the team assessed the mycobiome and bacteriome of patients with Crohn’s disease and their Crohn’s free first degree relatives in nine families in northern France and Belgium, and in Crohn’s-free individuals from four families living in the same geographic area. The presence of all ‘three’ in the sick family members was significantly higher compared to their healthy relatives, suggesting that the bacteria and fungus interact in the intestines. “Our study can result in a new generation of treatments, including medications and probiotics, which hold the potential for making qualitative and quantitative differences in the lives of people suffering from Crohn’s disease,” Ghannoum concluded.